The Amazing Spider-Man 2…not quite amazing. Good, just not AMAZING. I guess I can do the bad news first and then work off the good news. Most people seem to like it that way. In this case, there was way too much back story for my taste. The groundwork was laid in the first movie and could’ve played throughout the first movie, in my opinion. Brief flashbacks could’ve been used instead of entire sequences. This pretty much muddled up the story line for me. I love the whole mythos of Spider-Man. I have a Spider-Man tattoo for goodness sake. But this back story was way too much for me. It made the 19 year old Peter Parker feel more like the 6 year old that was initially left with his aunt and uncle. As for the budding friendship between Peter and Harry…meh. It seemed too forced. Without giving any spoilers, I will say that it had me feeling uncomfortable. It was just too awkward. Overall, there were parts of the movie that seemed rushed. As if they were trying to put too much into it. On to the good news now! The visuals were AMAZING! It was truly the first movie I have seen in the 3D (since Avatar) that actually USED 3D to its advantage. I have never felt more like I was Spider-Man swinging through the concrete jungle that is New York. The special effects were mind-blowing and really played a huge part in making this movie the eye candy that it was. NOW I will talk about the audio. WOW. The audio team worked there butts off to make this a movie you’d want to hear! The Magnificent 6 wanted people to notice that the sound of a movie is just as important as the visual effects. And they did a wonderful job. Performances from the cast were phenomenal! Jamie Foxx’s character, Electro, really grew on me. I wasn’t expecting him to be portrayed as seriously as he was. Kudos to Jaime Foxx for making a B-list character a force to be reckoned with! As for the rest of the cast, amazing performances all around. 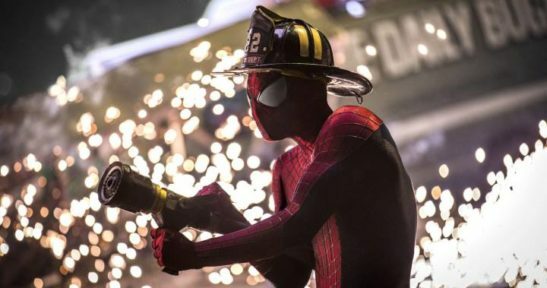 Once I got over the man-child sequence that was Peter Parker (I’m not trying to be harsh, they just played the brooding teenager a little much in this one) I could really enjoy the movie. Some of these performances were worthy of awards. Emma Stone’s Gwen Stacey will live on as the best on-screen portrayal of a female love interest I have ever seen. EVER. Dane DeHaan…WOW. I know I said before that Harry’s initial meeting with Peter was awkward, but in no way did it take away from the duo’s acting. Dane Dehaan will become a household name soon enough. He played Harry Osborn perfectly. You can tell he did his homework as far as the character goes because he really sunk into the role of Norman Osborn’s son. I won’t give away any spoilers but he really is the only Harry Osborn in my book…sorry James. Getting back to the title hero, Spider-Man was all over the place. The emotion that Andrew Garfield had to show in this movie was nothing short of amazing. He had to transform almost completely throughout the entirety of the movie. I haven’t been on an emotional rollercoaster like that since TGIF went to Disney World (dated reference). His performance was really believable and I think that is what will give this franchise the staying power it needs to keep going. With all things considered, this movie does an incredible job getting you emotionally invested in the series and keeping you entertained with visuals. The potential for this franchise has more than exceeded my expectations after the first trilogy. I just hope they can keep the momentum going. Other images: ASM 2 official site. Great review. 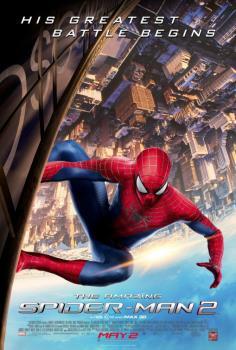 I still haven’t seen The Amazing Spider-Man, so I’m in no rush to see this one. I’ll get to it once it’s on Blu Ray. LOVED the TGIF reference, though, and I totally got it! Glad you liked the review! I’m taking both of my kids to see it this weekend because they loved the first one. For new fans, I think this is the trilogy to stick with :) And thanks for getting the reference! !